If you haven’t started the process, attorney Matt Cubiero has written an excellent “Guide to Obtaining a CCW In Orange County.” You will find this a valuable resource that will take you through every step in the process. The live-fire training is the last step. If you’re finally that far along in the process, then this course is for you! The NRA Personal Protection OUTSIDE the Home (PP2) is the next level up from NRA Personal Protection INSIDE the Home. The main focus of this course is the effective use of a concealed handgun for self defense on the street. Included are chapters on concealment techniques and devices, presenting the handgun from concealment, utilizing cover and concealment outdoors. This innovative course include presentation and movement, point shooting, instinctive shooting, low-light shooting, engaging multiple targets and one-hand shooting. These skills and other presented in this course form the core shooting skills used to counter a life-threatening attack outside the home. The course is divided into two levels: Basic PP2 and ADVANCED PP2. The Basic Level covers presentation from a concealed holster (or purse), shooting from cover, shooting one-handed, and point shooting. The Advanced level includes moving while shooting, shooting from low cover, shooting from sitting, turning, prone, low-light and hip-shooting (called the “speed rock”). In total there are seven segments including Strategies for Personal Safety Outside the Home; Carrying a Concealed Handgun and Presenting from Concealment; Developing Basic Defensive Shooting Skills; Developing Concealed Carry Skills; plus the all-important Self-Defense and the Law. The course is a hands-on program with both levels encompassing fourteen hours of classroom and range instruction. 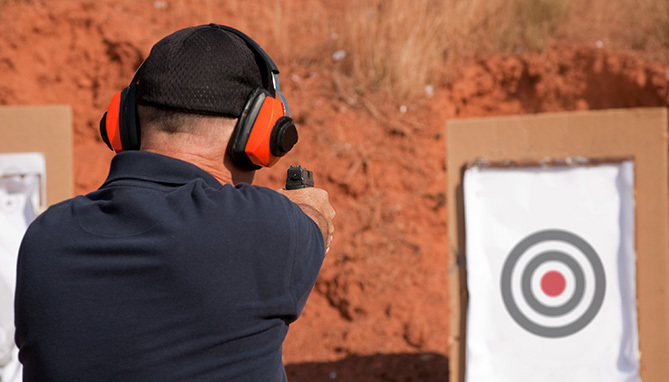 This is an ADVANCED handgun class, not for beginners. For those with no competitive or stress-fire shooting training, we offer a “Pre-CCW” class, which will introduce less-experienced handgunners to the drills, commands, and equipment necessary to be productive in the mail course. To read more about this class, click here. This is an advanced handgun course that is approved by the Orange County Sheriff for their Concealed Carry Weapon (CCW) permit. Click here to see my current schedule. TJ Johnston - Chief Instructor: dedicated to developing the confidence and ability of students to properly and skillfully employ whatever tools available: fists and feet, or pistol, rifle or shotgun. Even though the training at AllSafe is all about fighting, the focus of AllSafe is to make the learning enjoyable, even fun! AllSafe Defense Systems provides the full spectrum of training, included armed and unarmed self-defense. Courses include basic awareness training, assault avoidance, street fighting, and firearms training.